Some of Australia's most popular home builders have helped us to identify the biggest design trends tipped to take 2016 by storm. Open plan designs have dominated the housing market in recent years and this will continue throughout 2016. Combined kitchen, living and dining areas create the look and feeling of space, while providing fantastic opportunities for entertaining. 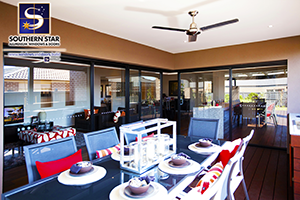 This effect is maximised by large windows and bifold/stacking sliding doors that seamlessly blend indoor and outdoor. It’s all about comfortable, practical and stylish living space, while being conscious about environmental footprint and integrating the outdoors. Effectively utilising natural light and premium glazing options reduces the need for electronics such as lights, heating and cooling. 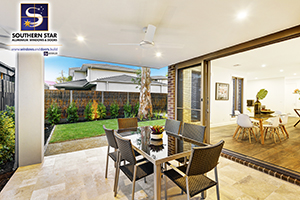 Alfresco areas are a popular element with a large emphasis placed on not only the area itself, but also how it connects to the indoor living space. 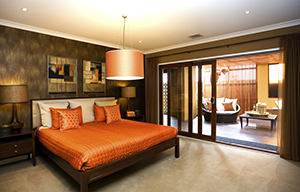 2016 will see a variety of interior trends used as either overall themes or combined for desirable effects. Metallic colours and materials will remain a popular choice for those looking to create a sleek, stylish and sophisticated atmosphere. Cooling metals, such as chrome and silver, as well as warming metals, like gold and brass, are becoming increasingly popular. Powder coated Aluminium windows and doors bring these colours beautifully and cleverly into any home. Timber remains as a classical favourite choice that can be integrated well with most interior design schemes. Timber windows and doors work fantastically with trendy materials like raw or polished concrete and marble. We are seeing a variety of materials and colours intertwined to create bold and beautiful designs unique to individuals, in order to create their ideal homes. There is a large focus on warm and inviting rooms that display an organic feel thanks to textures and wide application of timber and other materials. Elements such as panelling, features and fittings will all add a sense of dimension through texture. With the desire to bring the outdoors inside evident within the creation of indoor/outdoor space, it is no surprise that nature will play a large role in 2016. This trend will see potted plants, green colours, nature inspired décor and art flourishing within homes. There are forms of nature to suit any taste from artificial plants to cacti. This is a great way to further brighten spaces and bring a beautiful and earthy feel into the home, combining with large windows and natural light. Access to the outdoors can be achieved by a number of different door styles like large glazed sliding and stacking sliding, functional bifold and stylish French doors, each providing a unique look. Fortune favours the bold; with striking colours, fixtures and statement pieces an important part of individual rooms and homes as a whole. From feature walls in bedrooms to artwork in the kitchen, hot and vibrant colours including yellow, green, blue and pink are an effective way to create wow. Colourful wallpapers, cushions and furniture can be utilised to add a bit of pop to your home that’s sure to impress. Grand entrances with pivot doors create stunning bold first impressions while French and internal doors provide statements throughout the home. Geometric patterns are in with the style being seen in flooring, tiling and decorations. The lines and patterns are a great way to create eye-catching contrast and clean calming environments. We are seeing these patterns not only in large spaces such as flooring but also in small pieces like vases, furniture and accessories. Much like the theatre, a large amount of entertaining in the home happens behind the scenes. In order to provide the most effective and efficient entertainment, people are looking to utilise the likes of sculleries and butlers pantries to hide the mess and preparation. Sinks, dishwashers and even fridges are being relocated to private areas in the kitchen often secured behind doors. The desire to present a clean and functional space for guests and families is strong with these types of kitchen setups becoming increasingly popular. Bifold windows with servery sills allow kitchen access to alfresco areas, further assisting the entertaining focus of modern homes, while keeping a clean and sophisticated look. Cladding is an effective method to create stunning facades and spaces. Reiterating the trend towards bold statements, the addition of timber elements to rendered elevations is in demand. 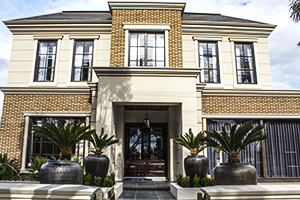 Hamptons, Coastal and Industrial styles are all tipped to be amongst the most popular during 2016. Clever design and usage of materials like timber create unique and beautiful homes that are sure to impress and welcome you home. Furthermore, a timber alfresco is considered a must by many new home builders/owners with these spaces almost expected. As the market begins to be populated by Millennial’s who have grown up with technology, their desire for it appears to be driving the growing trends towards in-home tech. This is evident with furniture, appliances and homes becoming more technologically integrated. Robot vacuum cleaners, inbuilt coffee machines, smartphone controlled lights, wireless sound systems and internet connected fridges are just some of the popular technological elements homes are beginning to be fitted with. This trend is predicted to continue with homes becoming increasingly digitized for ease of living. Technology can assist in reducing clutter and even bills with many smart devices much more energy efficient than traditional.